What can spell more comfort than cotton in summer? A fabric preferred by millions for its light, breathable appeal, cotton is a staple during hot summers in India. As temperatures begin to soar from April, many of us put away the synthetic blend fabrics and bring out the cottons. Cotton probably entered the Indian wardrobe by the way of Khadi. Though rustic and thicker than normal cotton, khadi clothes are handwoven and eco-friendly. The mulmul cotton is however the best suited for hotter climes. This fabric comes in eclectic prints and minimizes perspiration. Summer ward robe mostly comprises of light clothing. Dresses, skirts and shorts are best outfits to wear during summer. Cool, breezy tops paired with culottes work well for office, too. One garment to be avoided is the Jeans. Though comforting and fitting for many, it may not be wise to wear it when mercury levels soar. Colors also play an equally important role. Pastel shades are soothing to the eyes of onlooker and also makes the wearer feel comfortable. It is a known fact that darker shades absorb more heat and as a result the wearer feels sweaty or warmer than the ambient temperature. So, it is no surprise that white is a favorite color for many designers while designing a line for summer. The opposite effect is brought on by black. Not that black is inauspicious or anything. Beware of superstitions! Fact is black absorbs heat. Hence, naturally when the sun is at its peak, and you wear black, suffocation due to heat is bound to occur. Black may be ideal for night wear. The little black dress is not immortalized for nothing! Sometimes, one can rely on common sense, which is rather uncommon. If that is the case, draw upon reserves of your experiences with colors and seasons. Pastels and dark shades can be mixed and matched. For instance, a pastel or white top can be paired with darker shade cotton trouser or skirt. 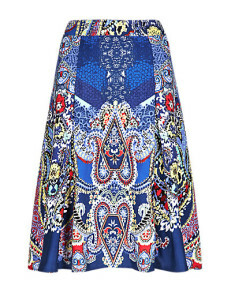 This summer, wear an A-line skirt with paisley prints and team it with a light colored top or vintage blouse. Possibilities are endless. Summer dresses are also a great option to be stylish and stay cool at the same time. Those wearing traditional outfit can choose cotton sarees or kurtas. Indian handlooms from different parts of the country offer a huge variety in cotton fabrics and sarees. Make the best of exhib itions held in your town. This way you will also support the local artisans besides getting a ethnic addition to your wardrobe. While you are all busy looking at clothes, don’t forget to equip yourself with basic summer care items. Make sure to invest in UV protective sunglasses. These will shield your eyes from scorching sun. Also, wear a sun-screen, if you are allergic to sunlight. Choose one without heavy chemicals in it. Or, let the skin soak in all the goodness of vitamin D freely available from sun. One gets to see women with their faces covered up in scarves in many towns and cities of India. That is one good option especially if you want to protect your skin without using chemicals. However, it is best to avoid outdoors when sun’s rays are at their strongest. Keep cool with beverages and juices. Thanks, Ananya. You have got a great blog! And the LBD looks cool.